The Electric Blue Hermit Crab, a very rare find, originates exclusively from the Marshall Islands. This crab has electrifying blue legs with black banding, and its antennae stand out with its bright orange color. 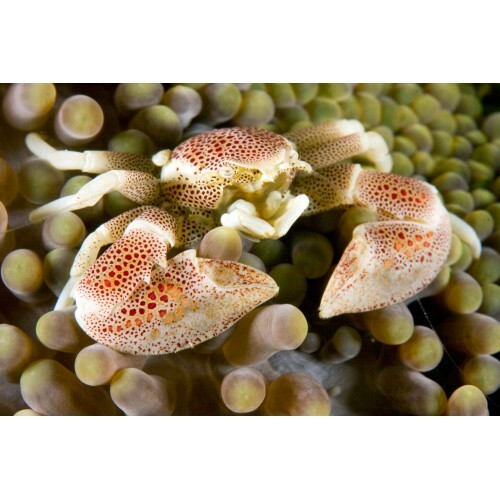 Both claws are close to being equal size, and are brownish green in color. This tiny crab lives in abandoned snail or triton shells, or it may resort to attacking and eating a snail so it can use the shell for its home. The Electric Blue Leg Hermit Crab is a valuable addition to an aquarium because it will eat algae including green hair algae and cyanobacteria. In addition, it provides valuable aeration by sifting through the sand. This is one Hermit Crab that is reef-safe. If there is an insufficient amount of algae present, the Electric Blue Leg Hermit Crab will need to be fed dried seaweed.